Hudson is scheduled to perform Sunday on the Main Stage from 3:25 until 4:35. Hudson featuring Jack DeJohnette, John Scofield, John Medeski & Larry Grenadier will come together at Freihofer’s Saratoga Jazz Festival in celebration of Jack DeJohnette’s 75th birthday. 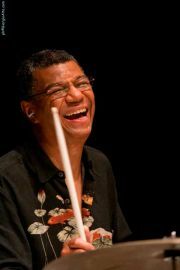 The Los Angeles Times has called Jack DeJohnette “one of the finest living jazz drummers, a limber musical thinker and technical dynamo, one who challenges tradition by pushing outward while digging in.” The all-star band’s name, “Hudson,” and the music on their debut album, honor the Hudson River Valley, where each of the members resides. Photo credited to Giorgio Alto.